Google+ Messenger is being pulled from the Google+ for Android app today as the company looks to prioritize its newly launched and standalone cross-platform messaging service Hangouts. Ever since Hangouts was launched at Google I/O for Android, iOS and Chrome, it’s been clear that Google+ Messenger would soon follow the growing number of ageing Google services being left at the wayside. Both fill identical purposes in Google’s product portfolio and to develop both simultaneously would have been wasteful, as well as confusing for users. As noted by Google’s Vic Gundotra, Messenger is only being removed from the Android app to begin with; the Google+ app for iOS will follow suit at a later date. Users will also be able to download their Google+ Messenger conversations through Google Takeout for prosperity later today. Version 4.1 of the Google+ for Android app also includes simpler account and page switching, similar to Gmail. Rather than signing in and out again (a somewhat laborious process with passwords and whatnot) users can jump to another pre-registered account with a couple of taps from the app menu. A second option underneath offers a shortcut to Google+ pages, which will no doubt be welcomed by social media managers, page administrators and community moderators. Google Drive is also being integrated more deeply with Google+, giving users the ability to view and share individual files from within the firm’s social network. 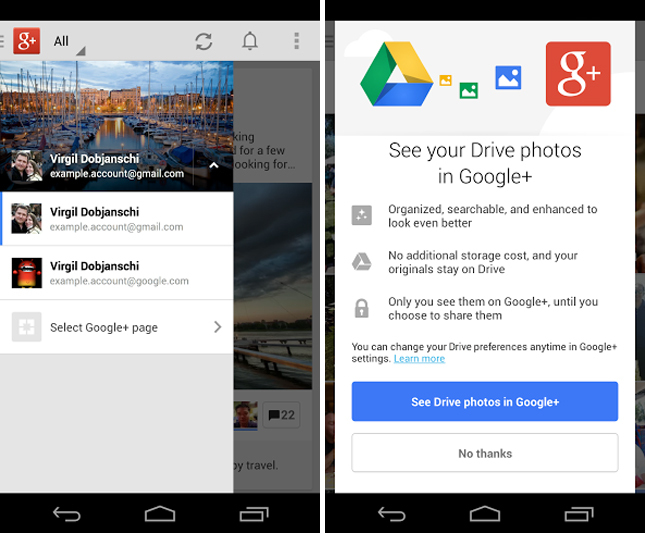 Drive images will also be enhanced automatically using Google’s ‘Auto Awesome’ photo-editing feature. 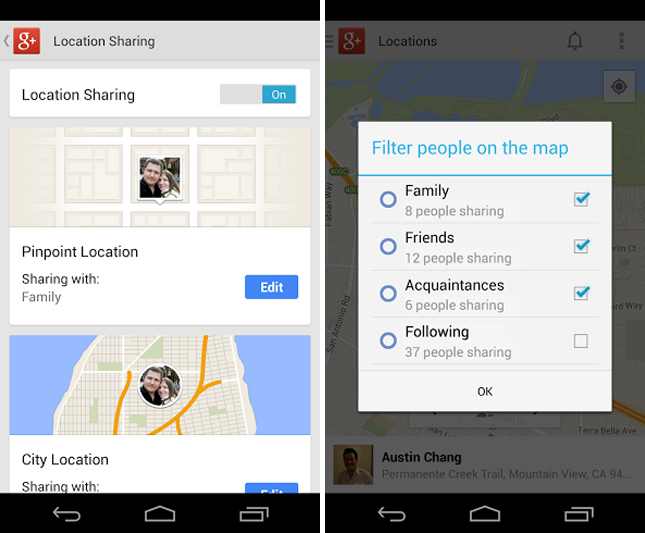 Google shuttered Google Latitude earlier this month in order to prioritize check-ins and location sharing on the Google+ mobile apps. The feature is yet to hit the iOS version, but the Android app has been updated with “pinpoint” and city-level locations, as well as the option to share that information with specific circles. The updated app will hit the Google Play store over the next few days.